The Lady Helena Swarovski headband from Aristocrat Tiaras centres on super sparkling flowers which has been created from Swarvoski crystal AB pear drop beads arranged in floral patterns, surrounded by strands of Japanese seed beads interspersed with crystal beads and pearls in flower designs. This bridal headband will make the bride feel extra special on her wedding day, will shine and sparkle under any light conditions and will produce dramatic light patterns on the dance floor! 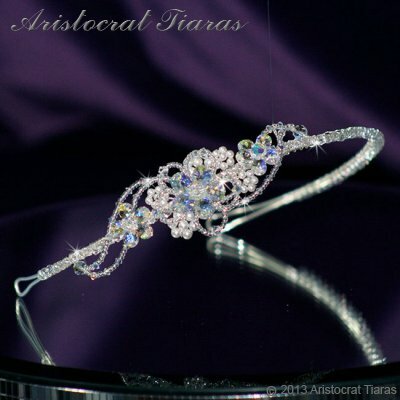 All our crystal bridal tiaras and hair accessories are handmade in Herefordshire UK. Colours and designs may vary slightly from the picture.